The 13-win Orlando Magic found new life on offense to pound the Boston Celtics 103-95. The loss marks the third in a row for Boston, as they try to refind their footing. Kyrie shot 6-7 (2-2 deep) for 15 of Boston's 29 points in the opening quarter. He also drew a charge on Jonathon Simmons. It's safe to say that it was refreshing to have Irving's offense reinserted into the lineup after their horrid 80 points put up against the Sixers. Together, Boston's backcourt combined for 23 of their 29 points. End of Q1: Celtics 29, Magic 28. Kyrie Irving exploded for 15 points in the quarter on 6-of-7 shooting. Jaylen Brown pitched in with 8 points of his own. The Celtics' defense was ugly in the second frame. They had several mental-hiccups that gave Orlando wide open layups and threes. On top of that, the Magic were knocking down tough shots. Evan Fournier (10 points) and Jonathon Simmons (9 points) were leading their perimeter attack, while Elfrid Payton and DJ Augustin (10 points each) were attacking the rim with little resistance from the defense. Orlando put 58 points on the board thanks to their solid offensive attack and Boston falling asleep on defense. Early in the quarter, the Celtics' scoring dropped off. The second unit struggled to get anything going, shooting a combined 4-12 for eight points. The Magic, on the other hand, enjoyed a 23-point contribution from their bench in the half. Halftime: Celtics 59, Magic 58. Orlando had a hot start to the second half. Led by Aaron Gordon, Fornier, and Payton, the Magic opened the quarter on a 21-8. That trio vicously attacked Boston's lackluster defense to build their largest lead of the night, 83-67. Irving did his part, knocking down two more three-pointers and keeping his team's offense functioning by shooting 3-6 from the field. The rest of Boston's players combined for just two points on 0-9 shooting during Orlando's 21-8 run, though. End of Q3: Magic 90, Celtics 71. Kyrie Irving has 32 points through 3 quarters. Brown: 13 points, 4 rebounds. Morris: 12 points, 5 rebounds. The C's found some urgency to start the final quarter, going on a 10-3 run to chip into their deficit. 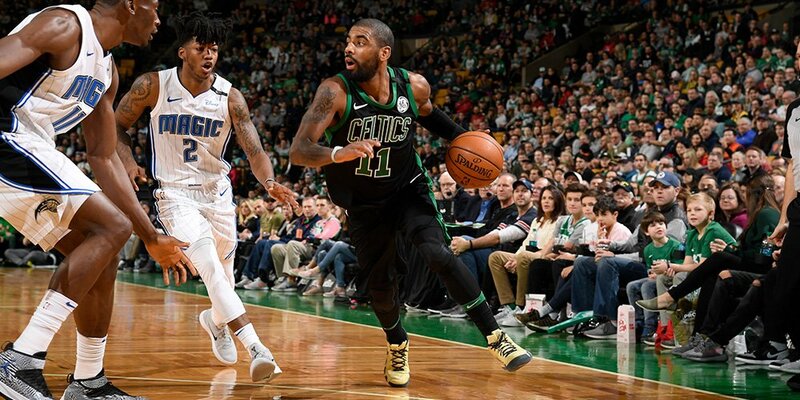 Jayson Tatum and Brown heated up to bring some life back into TD Garden, while Irving continued his sharp shooting. However, the damage had already been done. Payton kept opperating at a high level and helped fend off Boston's comeback push. Irving finished with 40 points, five assists, and seven rebounds in a losing effort.